Made for spending at some of Britain's best-loved restaurants, pubs, bars and hotels, the Dining Out Card turns eating, drinking and even sleeping into the perfect gift. Whether you're looking to treat someone at a cosy country inn or a smart city bistro, they'll find that great food, drinks and service are always on the menu. 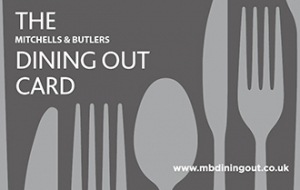 With over 1700 venues to choose from the Dining Out Card is accepted at stylish city favourites like Browns, Nicholson's and All Bar One, characterful hidden gems just waiting to be discovered plus a whole host of family–friendly brands like Harvester and Toby Carvery. Gift cards can be purchased with a minimum value of £10, up to a maximum of £250.